Bimota is an Italian motorcycle company located in the city of Rimini. Identifies the provider of the engine ("Y" to Yamaha, "H" for Honda, "K" for Kawasaki, "S" for Suzuki, "HD" for Harley-Davidson, then the "D" for Ducai). The only exceptions are the 500-Vdue which is concerned entirely designed by Bimota Tesi and (1D, 2D e 3-D), which has a particular pattern of front suspension. The Bimota was born in 1966 as a company in the field of heating and air conditioning. Its name is the first two letters of the surname of the three founding partners: Bianchi, Morri and Tamburini. A few years later Massimo Tamburini, designer, directs the company towards the production of special components for motorcycles and in 1973 the company began working in the motorcycle field. Bimota has never built engine on its own, with the exception of "Vdue-500". At the beginning of its activity creates Bimota frame and motorcycles in competition, the various were the YB1, YB2,YB3, HDB1, HDB2, and SB1. 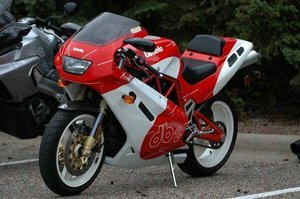 Bimota model names reflect the origin of the engines they begin with: Yamaha engined models being with a "Y", Honda models with a "H", Suzuki versions with a "S", Kawasaki versions with a "K", and Ducati versions with a "D". For example, the DB5 and SB8K are the 5th Ducati-engined and 8th Suzuki-engined models. HB1 First Bimota, made in 1972 by Tamburini from the wreck of a Honda CB750. 10 examples were ultimately made. SB2 Introduced in 1977. Used an engine from a Suzuki GS750. Dry weight was 60lbs lighter than the GS750. 140 units made. KB1 Introduced in 1978. Engine from a Kawasaki Z900. 827 units made. SB2/80 Introduced in 1979. Used a Suzuki GS750 engine. 30 units made. SB3 Introduced in 1980. Engine from a Suzuki GS 1000. 402 copies made. KB1 Introduced in 1981. Engine from a Kawasaki Z900. 827 units made. KB2 Introduced in 1982. Evolution of the KB1 using a Kawasaki Z500 engine. 177 copies made. HB2 Introduced in 1982. Used an engine from a Honda CB900F. Dry weight of the Bimota was over 70lbs lighter than the CB900F. 193 copies made. HB3 Introduced in 1983. Used an engine from a Honda CB1100. 101 units made. KB3 Introduced in 1983. Engine from a Kawasaki J1000. 112 copies. SB4 Introduced in 1983. Engine from a Suzuki GSX1000. 272 copies. SB5 Introduced in 1985. Engine from a Suzuki GSX1135. 158 units. DB1 Introduced in 1985. 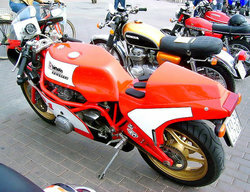 First Bimota to use a Ducati engine, in this case a Ducati 750. 453 units made. DB1S Evolution of the DB1, introduced in 1986. 63 copies made. DB1SR Continuing evolution of the DB1, introduced in 1987. 153 copies made. YB5 Introduced in 1987. Engine from a Yamaha FJ1200. 208 units. YB4 EI Introduced in 1988. Engine from a Yamaha FZ750. 303 copies. YB6 Introduced in 1988. Engine from a Yamaha FZR1000. 546 units. YB6 EXUP Evolution of the YB6, introduced in 1989. Engine from a Yamaha FZR1000 EXUP. Dry weight was 50lbs lighter than the FZR1000 EXUP. 650 units made. YB6 Tuatara Evolution of the YB6 EXUP, introduced in 1989. 60 units made. YB8 Introduced in 1990. Engine from a Yamaha FZR1000 EXUP. 252 units made. YB9 Bellaria Introduced in 1990. Engine from a Yamaha FZR600. 145 copies made. Tesi 1D Hub-steering model introduced in 1991. Engine from a Ducati 851. 127 copies made. YB10 Introduced in 1991. Engine from a Yamaha FZR1000 EXUP. 224 units made. Tesi 1D SR Introduced in 1991. Engine from a Ducati 904. 164 copies made. YB8 Furano Introduced in 1992. Engine from a Yamaha FZR1000 EXUP. 152 copies made. YB10 Biposto 2-seater introduced in 1992. Engine from a Yamaha FZR1000 EXUP. 38 units made. YB8 E Introduced in 1993. Engine from a Yamaha Yamaha FZR1000 EXUP. 169 units. DB2 Introduced in 1993. Engine from a Ducati 900. 408 units. Tesi 1D ES Hub-steering Introduced in 1993. Engine from a Ducati 904. 50 units made. YB9 SR Introduced in 1994. Engine from a Yamaha FZR600. 651 copies made. SB6 Introduced in 1994. Engine from a Suzuki GSX R1100. 1,144 copies made. SB7 Introduced in 1994. Engine from a Suzuki GSX 750. 200 copies made. DB2 SR Introduced in 1994. Engine from a Ducati 900. 157 copies made. Tesi 1D EF Hub-steering Introduced in 1994. Engine from a Ducati 904. 25 units made. DB3 Mantra Introduced in 1995. Engine from a Ducat 900. 454 copies made. BB1 Supermono Introduced in 1995. Engine from a BMW Rotax 650. 376 units made. YB9 SRI Introduced in 1996. Engine from a Yamaha FZR600. 225 units made. BB1 Supermono Biposto 2-seater introduced in 1996. Engine from a BMW Rotax 650. 148 copies made. YB11 Introduced in 1996. Used an engined from a Yamaha Thunderace YZF 1000. Dry weight 33lbs light than Yamaha. 650 units made. SB6 R Introduced in 1996. Engine from a Suzuki GSX R1100. 600 copies. DB2 EF Introduced in 1997. Engine from a Ducati 900. 100 copies. V Due Introduced in 1997. 2-stroke fuel injected 500cc engine made in-house by Bimota. 340 copies made. SB8R Introduced in 1998. Engine from a Suzuki TL1000. 50 copies. DB4 Introduced in 1999. Engine from a Ducati 900SS. [SB8K] Homogation version of the bike campaigned in World Superbike racing introduced in 2000. Engine from a Suzuki TL1000R. Dry weight 55lbs lighter than the TL1000R. 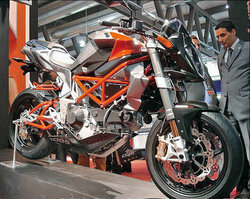 150 units were required to be made under World Superbike homogation rules. This is the last model sold as Bimota filed for bankruptcy in 2000. New owners relaunched company in 2003. Tesi 2D Hub-steering Engine from a Ducati 1100 Multistrada. Tesi 3D Hub-steering Engine from a Ducati 1000DS. DB5R Engine from a Ducati 1000DS. DB6 Delirio Engine from a Ducati 1000DS. DB6 R Engine from a Ducati 1000DS. DB7 Engine from a Ducati 1098. In 1983 Tamburini leaves Bimota and successor Federico Martini, author of themotionDB1 (the first motor Bimota Ducati) and chassis aluminum became a box Bimota standard. Its also YB4Rwhich won the TT F1 World with Virginio Ferrari. Federico Martini introduces the first in the motorcycle sector (including Japanese brands), the electronic injection engines 750 cc, which is competing in the series production. Anche Federico Martini lascia però la Bimota. They were the first Nineties, and is replaced by Pierluigi Marconi. Marconi continues the construction of aluminum chassis box, and come YB8, YB8 E, YB8 Furano, YB9 Bellaria, YB9 SR, YB9 SRI,YB10, YB10 tandem, YB11, SB6, SB6R, SB7, SB8R. But Marconi take new roads, and its oval tube chassis was born DB2 SR DB2, DB2 EF, DB3", " Mantra", Supermono tandem, 500-Vdue, Thesis 1/D(with front swingarm instead of the classic fork). The 710 cc Supermono, prototype of the "Supermono tandem with BMW-derived engine and made competitive by Fiaccavento conducted by Gianluca Galasso countdown Ducati" clapper "driven by Pierfrancesco Chili winning the European Championship race at Mugello category. Galasso won the Italian title with the same bike. Following the "500-Vdue", the only model produced entirely by Bimota, equipped with a propeller longitudinal V-twin 500 cc), first two-stroke engine operated by injection electronically. At the end of the nineties comes the decline, due to a financial crisis. At the beginning of the decade, the bike is the most importantRSB8, with aluminum frame and carbon. With theKSB8 Bimota back to competitions in the World Cup Superbike for derived from the series, and by the second race wins the first victory in the wet, with Anthony Gobert. 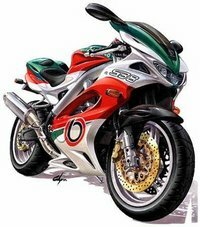 A cure engines is derived Suzuki Farnè, but the financial crisis grows and the Bimota declaring bankruptcy. In 2003 a new property restart the activity by making major investments. The first motion made,theDB5, awarded by the 2004 Motorcycle Design Award ", title issued for the Supersport category from the" Motorcycle Design Association. This motion presents the trellis swingarm tubing, painted in red as the chassis, coupled to an aluminum plate and called the "composite Traliccio". 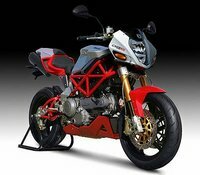 In 2005 Bimota launched at the Salon of Milano anakedon a DB5, designed by Sergio Robbiano of Robbiano Design:the DB6 Delirio. The following year the exhibition is an opportunity to present the two-seater version of the DB5 Mille but especially the third generation of the thesis calledTesi 3D, with a fairing in essential classic colors red-white Bimota. 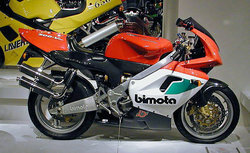 In 2007, the Fair of Milan, presents the Bimota DB7, designed by Enrico Borghesan, which presents different motorcycle technical innovations as the rear suspension system on the engine infulcrato (solution used in MotoGP) and the rear frame made entirely of fiber carbon self, as the front frame. The frame is a mixed lattice in oval section tubes and plates cut from solid aluminum. The DB7 has a budget cycle of the first order, while the vehicle is entrusted to the Ducati 1099 cc from which equips the 1098th DB7 in a standard configuration has participated in the tender of the mugello Desmo Challenge 2008 with Danilo Marrancone, centering an important result: in his victory. Bimota many are engaged in competition in the national and international trophies: Tesi 3D, DB5, DB6 and DB7 now. Bimota's co-founder and long-time chief designer Tamburini has been an influential player in the development of other Italian brands, most significantly his work on the popular Ducati 916 and MV Agusta F4; other designers such as current Bimota chief Sergio Robbiano have also been involved with larger-volume manufacturers.